Every summer we take on a new project, and this summer, we redid our two bathrooms. My son got married in Colorado, and I had two classes and an internship to complete, so the bathrooms were quicker projects since they had been done once before. This is the master bath. I made the shower curtain, and it took much longer than I thought it would. All of the ruffles are hemmed top and bottom to prevent fraying, and getting them aligned in a way that was at least presentable took about three days. 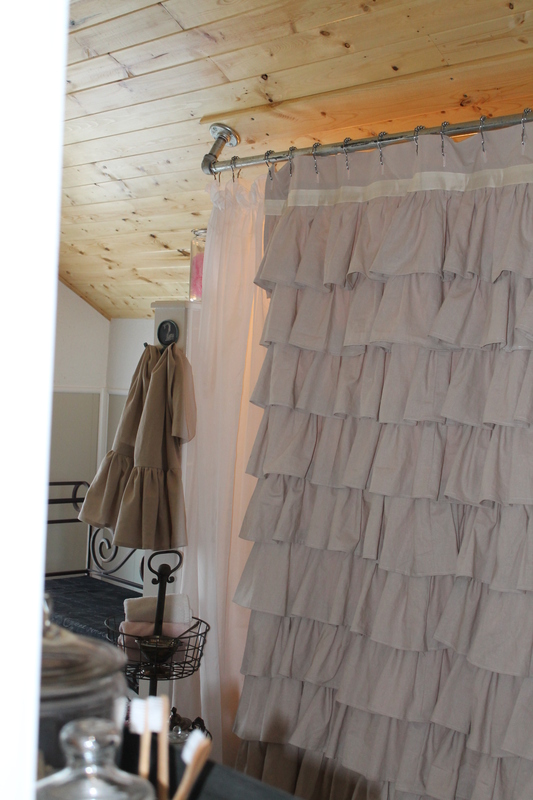 I used my vacay to make the shower curtain and the window curtains. Totally worth it! 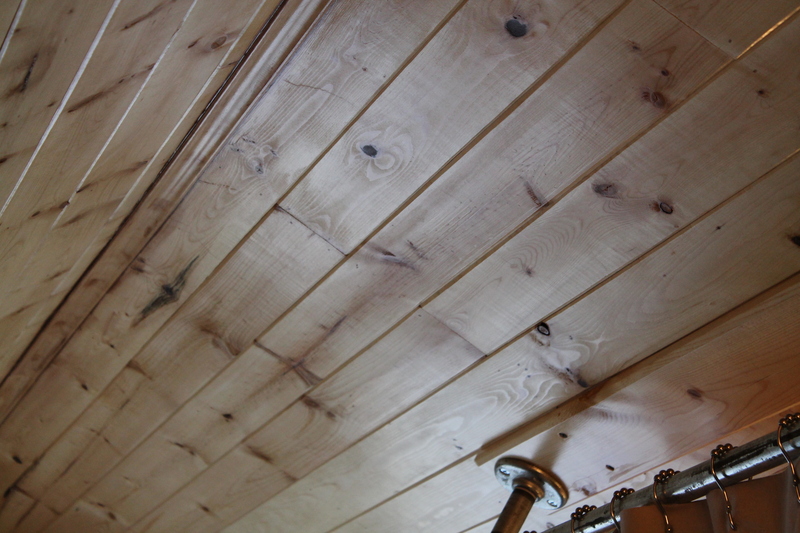 In between the wedding and the beginning of the school year, my husband put in a plank ceiling. 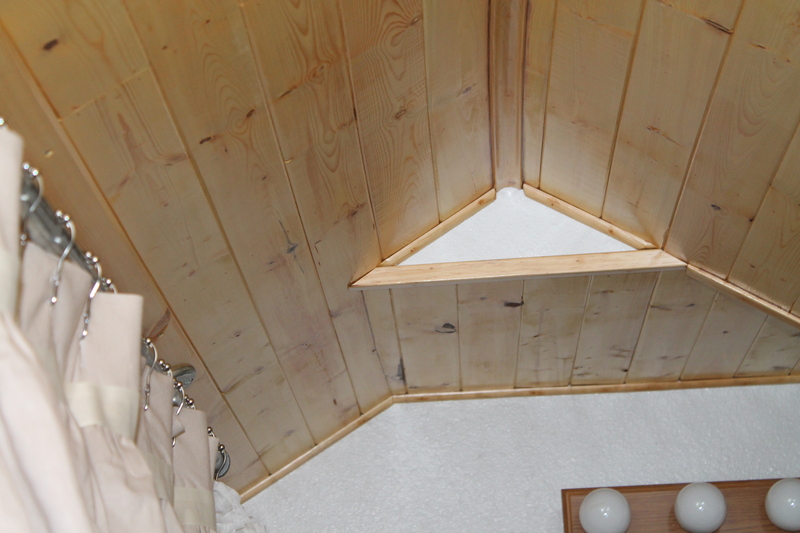 Since this is a converted attic space, we had lots of fun peaks to work with. Well, they are fun for me. Not so much for him. But he did a great job. I showed him Miss Mustard Seed’s bedroom and Layla’s dining room from The Lettered Cottage. When we started putting them up, and by we, I mean he, we decided that we wanted to preserve the natural wood. I am so glad we did. It has made a huge difference in the room and looks very high end. I think they actually planked together tighter than the examples we looked at because they weren’t painted. But he’s also an expert and tongue and groove after doing floors and walls. The ceiling cost right at 100.00 using the wood planks from Lowe’s, but it was a great investment. Covering up the popcorn ceiling was a huge improvement. Our master suite is a converted attic, and one of the good things the people did that we bought our house from was to put in these big windows. The bathroom ceiling went straight across at the place where it begins to angle, so it was impossible for anyone to use the bathroom without ducking except for me. 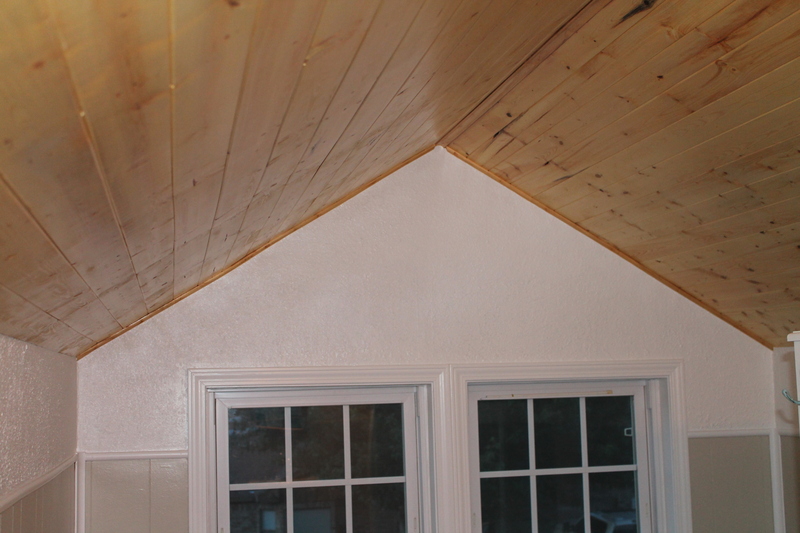 When we redid it the first time, my husband took the ceiling out and aligned to the roof line. I love the angles, and now anyone can walk into it. In the interest of time and money, we left the popcorn on the upper part of the walls but gave it a fresh coat of paint. The bottom of the walls was paneled, and we painted it with Revere Pewter by Benjamin Moore. Their paint is magical. I’m going to do a couple of other posts that focus on the accessories and the fabrics, but for now, this is a good look at my new bathroom. I am glad my white knight was born with a hammer and saw in his hands. He saves us a ton of money all the time, and everything in my house is custom. This entry was posted in Bathroom, home, Master Suite, organization, Uncategorized and tagged Bathroom, Benjamin Moore, Colorado, Layla Palmer, Lowe, Miss Mustard Seed, Paint, Shopping, Shower, The Lettered Cottage by Shannon. Bookmark the permalink.